Are you dreaming of a roadtrip to Balkan countries but you don’t have too much time? You’d like to use your holidays as efficiently as possible? I also was in a situation when it turned out I only have a week to make my project “Roadtrip Balkan Countries” happen 🙂 Even though usually I prefer to travel slowly and spend two months in the USA or in Thailand – this time I squeezed every last hour from this week and I visited four countries during one Balkan road trip. If you arrived by plane, rent your car in Sarajevo.Your Balkan trip starts in Sarajevo. We left Poland the day before in the evening and drove through the night to arrive in the morning to Sarajevo. 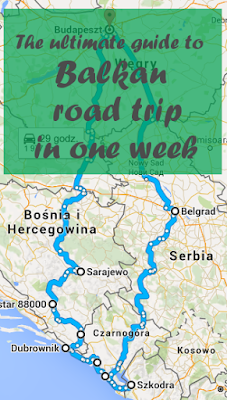 If you plan your Balkan roadtrip with two or more drivers, that’s a great option to save time. Take a walk along famous Bacarsija, visit a muslim cemetery and mosques. Go to the top of radio tower to see the city’s panorama. I fell in love with Bosnia in the first hour and when someone asks me where to go in the Balkans, Bosnia is my first recommendation.Spend the day getting to know the charm of Bosnian capital. Boost your energy with a strong bosnian coffee, taste famous burek. Burek sounds funny for me because it’s the most common name for Polish dogs… 🙂 the dish is great though! Mostar is an informal capital of Herzegovina known from a bridge originally from XVIth century. The bridge was destroyed during the war in Jugoslavia and re-built in 2004. Mostar is a small town and in one day you’ll know all its tiny streets – but it’s so cute that you’ll enjoy every minute of it :)Without a doubt, for me Mostar is one of the best places to visit in the Balkans. This charming town is located 130 km (2 hours drive) from Sarajevo. If you are not Catholic or religious, you can skip Medjugorje and go directly to Dubrovnik – one of the most beautiful cities in Croatia. If you can, check Google Maps to make sure which way will be the quickest – border crossing between Bosnia and Croatia gets jammed often.If you are a catholic and a religious person, your Balkan road trip itinerary should include Medjugorje. It is famous for apparitions of the Virgin Mary to six local children. Even though the catholic church hasn’t confirmed the apparitions to be real, Medjugorje became a site of pilgrimage for Catholics from all around the world. Climbing the hill and praying there is an important event. I found a good accommodation option for you in the Old Town. You can’t skip Kotor in your Balkans travel itinerary, trust me 🙂 Kotor is a town in Montenegro and its history dates over 2000 years back. It’s located by the Bay of Kotor (Boka Kotorska) which is often called Europe’s southernmost fjord. Take your time to visit the town and climb the city walls to take a look at the bay from above. You can stay in Kotor for the night or drive further to one of the towns at the seaside. We stayed in Petrovac. I hoped for a calm town but unfortunately, it wasn’t. Tourism in the Balkans is getting more and more popular and already back in 2014 it was super crowded. You could hardly find any building that wasn’t a hotel and small beach was crowded. I guess August isn’t the best time to visit the Balkans 😉 I bet it’s more pleasant in spring or autumn, outside of the peak season. Balkan road trip itinerary wouldn’t be complete without a lazy day on the beach 🙂 Spend the day in Becici and enjoy lovely water and the sun. If you feel like sightseeing more, check famous island of Sveti Stefan. A part of this drive runs along one of the most picturesque roads I have ever seen (and friends tell me I was asleep during the best parts 😉 ). Goes along the mountains and a part of it cuts the canyon of river Tara. The only disadvantage is that it took us 10 hours to drive the 500 km between Petrovac and Belgrade. But that’s including traffic jams and a stop for lunch in a restaurant. These views were totally worth it! After arriving to Belgrade, go out to get some great Serbian wine on Kneza Mihaila street 🙂 Stay in Ben Akiba apartements from which you’ll reach all important places in the city on foot. Spend the day sightseeing in Belgrade. Visit Kalemegdan fortress, the Church of Saint Sava, Skadarlija street. After spending the day in Belgrade we set off directly back home and drove to Poland through the night. I recommend this option only if you have more drivers. We had three and all of us had to drive for the others to rest. If you don’t want to drive through the night, then set off after resting well in Belgrade. If you rented a car in Sarajevo, you have 300 km to drive and it should take you around 5 hours. Previous Post Hiking The Red Peaks in Tatra mountains. Find motivation to leave your couch this spring!